This recipe for dairy-free avocado vegan brownies takes chocolate goodness to a whole new level by using healthy fats. Rich and delicious, you'd never guess that these sweets are good for you, too. They contain no butter, no eggs, and no oil. Instead, these brownies use natural ingredients that fit into a healthy lifestyle and offer a guilt-free dessert. They are great for people with egg or dairy allergies as well. Coat a 13x9-inch pan with cooking spray. Then, line the pan with parchment paper leaving a 2-inch overhang on both sides of the pan. Press down the parchment paper so that it sticks to the pan. Coat again with cooking spray and add a second strip of parchment paper laying it in the opposite direction also with a 2-inch overhang. Press it down and coat it with cooking spray. Set aside. In a medium mixing bowl, sift together the flour, sugar, cocoa powder, baking powder, and salt until well-combined. Set aside. In a large mixing bowl, beat together the mashed avocado, soy milk, water, and vanilla extract. Add the dry ingredients, mixing until well combined. Pour into the prepared baking pan and bake for 30 to 35 minutes, or until the top is no longer shiny and a toothpick inserted into the center emerges with only a few crumbs. 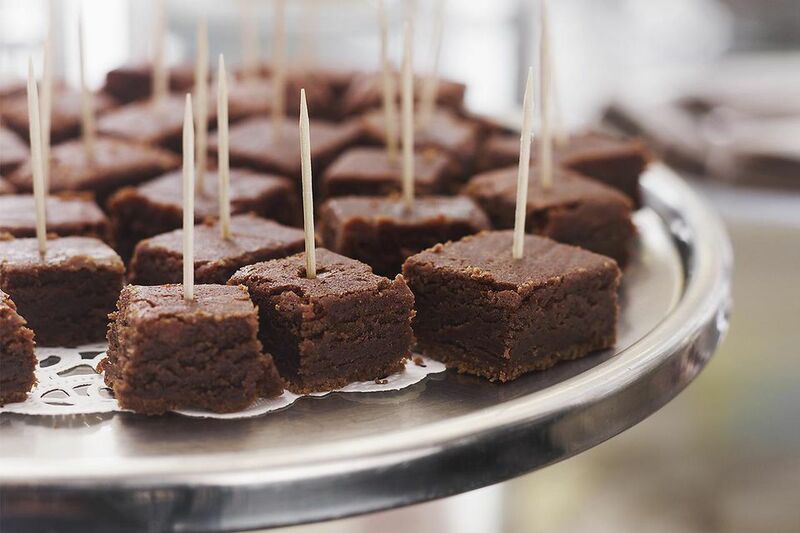 Allow brownies to cool completely in the pan before cutting into squares and serving. After brownies have cooled, grip the paper overhangs and lift the brownies out of the pan and transfer to a cutting board. Use a serrated knife to cut the brownies into 12 to 16 pieces, then lift off the parchment and transfer to a serving dish. If you're looking to keep the brownies for a short period of time, whether for a bake sale item for your child's school or packing lunches, you can store the leftovers in an air-tight container separated by wax paper and layered on top of each other for no more than a week. If you'd like to store them longer, you must freeze them in a freezer bag after wrapping them each individually. You'll need to thaw them overnight at room temperature or microwave them before serving them. They will keep anywhere from 2 weeks up to 3 months after being frozen.